I’ve spent the last few years working with AI, with WildFire and CogBooks, but here it is, in my home folks, on my kitchen table. First impressions? Looks good, a Space Odyssey-like column in black and my first encounter is quietly weird – a moving circle of blue light, a HAL-like halo appears, then a female voice. I say 'Hello', she says 'Hi'. I’m non-plussed by the gender voice farrago – a sort of ‘damned of you don’t, damned if you do’ argument. What I’m really interested in, is whether it is of any use. So a few ‘get to know you’ questions seemed appropriate. I’m here and my head is in the cloud. I am designed by Amazon. They’re based in Seattle, Washinton. I’m just over 232 millimeters. My diameter is 7.6 centimeters. I’m just over 1 kilogram. That’s not very nice to say. Several fairly anodyne jokes later…. First up… let’s not to compare Alexa to a human. It’s all too easy to do the ‘but she can’t do this… or that…’ thing. I’m not looking for a life companion, or a friend – I want to see if she’s useful. This is the first time I’ve used voice recognition in anger, woven into my life, so I’m keen to focus, not on problems but potential. So far, the voice recognition is damn good. I have a strong accent, that doesn’t throw her, and variations on the phrasing of questions seem to work (not always). There's a real problem with near-sounding homophones, but you learn to be more precise in your pronunciation. Next line of enquiry, ‘time’. You can ask it the time or date, even holiday dates, number of days until a holiday and so on. The sort of practical stuff we all need. Day of the week and date. Burns Night will be on Wednedsay 25 January 2017. How many days to Burn’s Night? There are 19 days until Burn’s Night. The timer functions are also neat, as these are often annoyingly fiddly on your cooker or alarm clock. How often do you pop something in the oven and either ‘look to check’ or suddenly smell the charred remains? How much time is left on my timer? Then there are the alarm functions. Set alarm for 7.30 tomorrow morning. All good, just ask, it confirms the time – done. To do lists are neat. I use a small notebook but for household stuff, a shopping list or to do list in the kitchen is neat. We can all add to the list. My gut feel, however, is that this will go the way of the chalkboard – unloved and unused. OK, let’s pause, as future uses are starting to emerge…. Only a start but I can already see this being used in organisations, sitting on the meeting room table, with alarms set for 30 mins, 45 mins and five mins, in an hour long meeting. Once fully developed, it could be an ideal resource in meetings for company information – financial and otherwise. 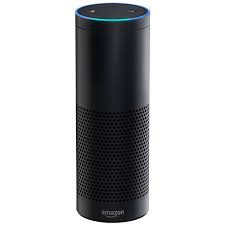 In fact, it struck me just playing around with these functions, that Alexa, as it evolves, will eventually make an ideal PA. Managers, according to a recent Harvard Business Review survey, spend 57% of their time on admin. Room for improvement there I think and an admin assistant seems likely. I've written a much longer piece on AI and management here. Gives SkyNews summary bulletin. Oddly it’s always sport – not that I mind but I need to sort that one out. Good summary of the weather for the day. I really liked this. You can ask for today’s or tomorrow’s weather, the current temperature outside, time of sunset, whether it will rain and so on. Useful. Ask it simple questions such as, Who is? What is? Where is? And curt answers come. What is more useful is the next level ‘Wikipedia’ stuff. You get extended pieces on any topic. Now that’s neat - a talking Wikipedia. Stuck me that it would be good to get the educational ball rolling on a subject with a child – more a parent-child thing. Not the hideous hot-housing, Tiger Mom thing but gentle informal learning, where you speak to your child and get Alexa to help. There’s lots of basic educational games being developed for Alexa, for that around the kitchen table learning. Could be fun. I could even see this being used in the classroom. I’d be interested in seeing it used with kids who have autism and other learning difficulties. Apart from being intriguing, on a serious note it does force you to pronounce words well then listen, does lots of maths, English and knowledge stuff. Early experiences seem quite positive… “You know that you have added an amazing resource to your classroom when students introduce their parents to “Alexa” at Back to School night. As if Alexa is another member of the class. I was able to experience this wonderful, and pretty hilarious, situation many times a short while ago”. This could go far, especially when strong support and lessons are delivered with personalised feedback, as it recognises that particular child’s voice, towards Teaching Assistants. It's use in SEND (Special Educational Needs and Disabilities) is, in my view obvious, but I'm not an expert. Accessibility is an important issue here and we can speak before we can read and write. For kids with dyslexia, dyspraxia, autism and ADHD, I'd love to get the view of specialist teachers about its potential. This intrigued me… She adds, subtracts, multiplies and divides, no matter how large the numbers, and handles negative numbers. Also does indices, roots, factorials. I have to say, she’s one fast calculator. It will give you pi to as many decimal places as you want. On formulae, it will tell you how to work out the area of a triangle. Even gave me the quadratic formula on request. On probability she will choose random numbers - give me a number between x and y – and roll a dice (any number of sides), pick a card and flip a coin. Then there are unit conversions, currency conversions and measurements. Teaching basic maths, conversions, units and probability, and so on, either in the home or in the classroom. Nothing fancy, just the basics. I’ve taught maths and it ain’t easy, especially with kids who don’t want to learn. I think this non-judgmental maths assistant thing could be useful, with personalized, sympathetic teaching. Word definitions, spellings (handled that old classic – antidisestablishmentarianism – with ease), synonyms can all be asked for. There are some problems with near homophones such as ‘quartz’ and ‘courts’. You’ll encounter this quite quickly. Easily remedied with a rephrasing of the word. There are audiobooks and, of course, going back to Wikipedia, lots of background stuff. Given the effort you have to make to converse – pronounce your words, think about what you’re about to say, when Alexa moves from monologue to dialogue, this could be a boon for the language development of young children. At the moment Echo is only available in US and British English but you can also change the language to German from your app. This is neat as you can ask questions in English and get German replies to any question. Language learning will surely be possible. That informal learn and practice while you’re doing other things in the kitchen. Teaching basic English. Word games, daily words, unlimited access to literature. It struck me that as someone who is learning English, this could be a great way to improve your pronunciation. Duolingo is already using bots, surely this is the next step? You can ask Alexa questions and there’s a good chance you’ll get a good reply. What is the chemical symbol for ? Yip. What is the chemical name for salt? Yip. What is the chemical formula for water? Yip. Quickly trickles out but you can see the direction of travel here…. How many bones are in the human body? Yip. What does DNA stand for? Yip. What is the capital of (country, state, counties)? Yip. What is the population of (countries, cities)? Yip. What is the area of (country, continent)? Yip. What is the longest river in the word? Yip. I know it’s all about facts but it’s a start but here’s where it gets interesting. You have access to Wikipedia. Simply say Alexa, Wikipedia and name a topic. I’ve been using this like crazy. Imagine when Alexa not only has the breadth and depth of an expert in any subject, as well as the patience, ability to read your voice and react to your personal learning needs. Imagine this 24/7. Imagine this for free. I like podcasts. I’ve been listening to the In Our Time Radio 4 podcasts on history, science and philosophy for years. I like the fact that you’re hearing world-class experts give their takes, without pre-packaged images. You’re mind remains your own and can focus on the ideas. This is distilled knowledge at its best. Audiobooks are the next step up. So for the short stuff – there’s podcasts galore, through Tunein and other services and there are more books than you’ll ever read. Of course, there’s tons more – any radio station you want, ordering taxis, pizzas, getting the phone number of a local business or restaurant. With Spotify, you get that music on-demand thing, as songs and artists come into your head. There’s lots of controls here even down to who sang what song, names of band members and so on. What movies are playing? It lists movies playing locally, tells me about the movie. However, usefully, she will if prompted, give me the names of the actors and, most useful of all, an IMDb rating. For general movie knowledge it will answer questions about who played what role. The important thing here is not the device but Alexa and the AI, or rather a range of AI techniques, that lie behind Alexa. NLP (Natural Lnaguage Processing) is striding forward. We will see Alexa technology pop up in all sorts of contexts - in cars, TV, watches, you name it. This is about deep-seated changes in technology not the surface devices. OK all of the above has been without adding any new ‘skills’ – my first encounter. There are literally hundreds of these skills available. This is merely an echo of what’s coming. Listen carefully and you’ll hear whispers of the future. AI’s been in your life for a while – Google, social media, Amazon, Netflix… What’s new is that AI is here, a real presence, in your home. This is only an audio device, and not unsurprisingly that’s its strength – radio, news, weather, quick questions, audiobooks, podcasts. But it’s a natural form of communication and learning. Like most tech it gives back what you put into it. For me, it’s all down to habit. Sure Alexa is handy, convenient even, but you need to put the effort into make her work for you. By way of background information, I've written a piece on the role of voice in learning, and why I think it matters. More reports on Alexa will come as I get to know her better…. I think I need to sign Alexa to our pub quiz team, she would nail week after week by the sound of it. I've had Alexa for a while now I had it shipped from USA a while back so I've had a fair few months with it. To be honest I really use it for anything other than vocie assistant for my smart home set up. I think with us digital L&D type folk we've become so use to mobile and having the answer to any question in our pockets that I still find it easier to use my phone be it random questions cooking alarms etc. I think Google home/assistant would hey AI of choice for the training room or meeting room. Due to its large database of knowledge and user behaviours. Once Google assistant get pushed to more device other than their new pixel I think we will start to see the real power of real time suggestion without having to move from one screen to a Google search page. If it can start to manage various calenders I can see this as you highlighted being a great PA and note take for meeting and setting future actions. Very hit and miss on metrical units in poetry. "I purchased 2 of the Amazon Echo Dot's for use in my home. Connected some lights and a electrical switch to do voice control. "Alexa, play Beatles music". Works great! Started thinking how these can be used in healthcare. One idea I thought of is use in the operating room. Use voice to turn on/off lights, play music, order some supplies, pizza :-) How about one on a crash cart? "Alexa, what is the ACLS protocol for ventricular tachycardia?". I think this device has a lot of potential in healthcare applications and is inexpensive too."